This is an all steel Romanian made drum magazine that is suitable for use in any AK variant chambered in 7.62x39. This drum mag holds 75 rounds and offers the same reliability the AK has been famous for. These are service quality military specification magazines that are in use in many armies around the world. The Romanian contract suppliers are famous for making steel magazines and have a history of providing some of the highest quality products on the market. The dark blued steel offers a good fit for most AK/clone rifles and offers some minimal protection against the elements. More than the surface finish though, the extreme quality of the metal work on these drums makes these a long-term investment for use in sporting or tactical environments. The flat spring with cranking key design has been proven reliable and offers ease of loading so many rounds. The constant pressure lock while loading gives quick reloading and keeps the magazine performing for many years without making it stay under undue pressure continuously. 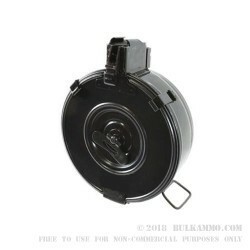 These drum magazines are exceptional quality builds and the fit and finish is of the highest level, considering the reputation for loose tolerances in the AK platform.